So do you fancy a change of lifestyle off grid and a cheap way to live. At the moment i'm living on the pontoon but it could easily be transformed into a pop up shop art studio, she measures 24ft x 11ft with a decking walk way around the pontoon and large decking area at the front, theres a stove and shower room and a kitchenette. 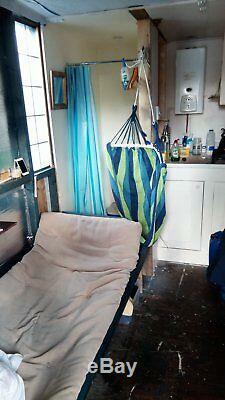 With a fold up single bed which can be used as a sofa during the day. If you must know this pontoon doesn't require a boat licence or boat safety licence, as its not classed at a boat, she floats on 8 blue barrels tightly packed with high density foam. Plus a high density foam front nose cone, under the decking. 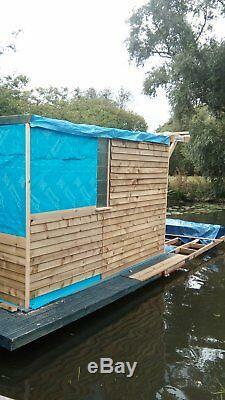 She covered in feather edge with a vapour barrier, insulation and lined with 18mm ply. 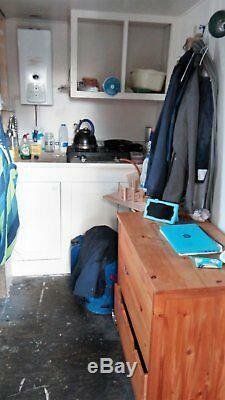 The kitchenette has ample cupboard space and work surface. She runs off 2 x 135ah batteries topped up be 100 watt solar and 4hp wind turbine. 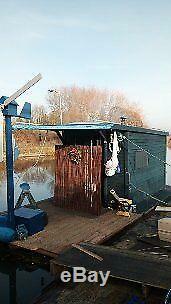 All you'll have to do is either moor the pontoon off grid or find a mooring for 240v hook up. This would be a great opportunity for someone who's thinking of studying at Cambridge uni. No need to pay high rent and sharing bills. Long gone are those days if you bought the pontoon. All you have to do is find a mooring between waterbeech and Cambridge. Its easy to plug in tv and laptops , phones to the two batteries, connected to the solar and wind-turbine. I use a little genni if I need 240v for anything. 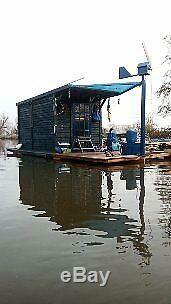 The pontoon can be used as a day boat, river hut, shop, houseboat, art studio, café etc. Any questions feel free to ask. The item "Pop up pontoon, houseboat, shop, art and crafts" is in sale since Wednesday, January 30, 2019. 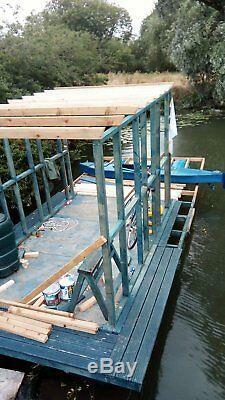 This item is in the category "Cars, Motorcycles & Vehicles\Boats & Watercraft\Narrowboats/Canalboats". 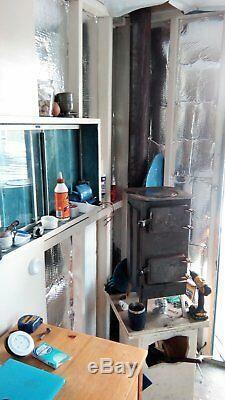 The seller is "leenglan-8" and is located in Downham Market. This item can be shipped to United Kingdom, United States.